This Order, the highest in the Grand Duchy, was founded hy Margrave Charles William of Baden, Durlach and Hochberg, on the I7th June, 1715 — the day on which he laid the foundation stone of his castle at Karlsruhe, and which is still the annual meeting day of the Chapter. The Order was renewed on the 8th May, 1803, by the Elector, afterwards Grand Duke Charles Frederick, Margrave of Baden, on the occasion of the electoral dignity being transferred to the reigning house of Baden. It has since been divided into two classes : Knights of the Grand Cross and Commanders. But by the new statutes of the 1 7th June, 1840, only the first class was retained, numbering in it, no one but reigning Princes, Princes of blood, or such eminent men in the Grand Duchy who bear the title "Excellency", or are already in possession of the Order of the Zahring Lion, or have peculiarly distinguished themselves by extraordinary acts of loyalty or valour The class of Commanders has ceased to exist ever since 1814. The badge (Nos. 1 and 2) is an octagonal Cross with the ducal crown above it, enamelled red, and two C's in monograms connecting each of the four corners. The same initial is seen on the white centre, where it is represented leaning on green rocks, surrounded by the motto of the Order : "Fidelitas" (Loyalty). On the reverse of the Cross are the arms of Baden. 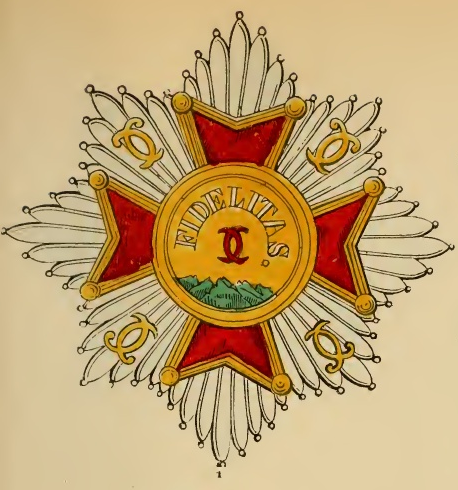 It is worn by a broad orange-coloured ribbon with silver borders, by the Knights of the Grand Cross across the right shoulder, and by the Commanders round the neck. On the left side of the breast is, in addition, attached a silver octogonal star, to which is appended the same Cross of the above description, except that the motto and the middle scutcheon are of orange colour.